I have said this before but I am still amazed at how many people don't know this fact. I think it's important enough to remind everyone. Even many straight supporters of gay rights don't know that in a majority of states, in the "greatest nation on earth", a boss could walk up to an employee, say "I am firing you because you are gay" and that employee has NO LEGAL PROTECTIONS...NONE!!! WASHINGTON -- Gay rights activists have made significant strides in recent years on marriage and military service, but one long-standing policy goal remains elusive: a federal law to ban discrimination against gay workers. Gays now can serve openly in the military. Gay couples now have some form of legal recognition in 19 states and the District of Columbia. 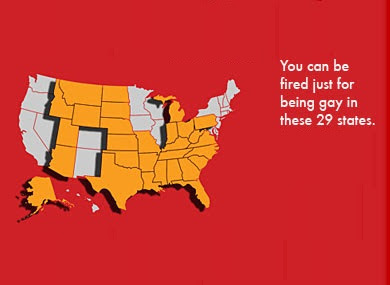 But in 29 states, gay workers can still be fired or denied promotions simply because they're gay. To be sure, 21 states ban job discrimination based on sexual orientation, and all but five of those prohibit bias based on gender identity. Hundreds of cities and counties across the country have enacted nondiscrimination laws. Federal government employees are protected by a policy that prohibits discrimination based on sexual orientation and gender identity. And nearly 90 percent of Fortune 500 companies have their own nondiscrimination policies. But some legal experts say workers and their employers need the kind of legal clarity that only a federal law can provide. Just because municipalities and companies have nondiscrimination policies, it doesn't mean discrimination doesn't happen, or that an employee who experiences discrimination has any legal recourse. "It's very important for the law to be clear and for both employers and employees to have clear rules in place," said Jennifer Pizer, the legal director for the Williams Institute, a research group that advances sexual orientation law and public policy at the University of California, Los Angeles. A federal law to ban workplace discrimination based on sexual orientation has languished for years. The Employment Non-Discrimination Act was first introduced in 1994. The House of Representatives approved it in 2007 on a bipartisan vote, but the Senate never took it up.